We enjoyed ourselves so much, staying here at your beautiful, lovely and yet so welcoming home! Right as we pulled up to the house the first time, we were so excited to see the incredible view. Then we got out of the car and a deer came right by us. From that first impression throughout our whole stay here, we truly enjoyed ourselves. We have been to the North Shore many times before and of course love the area. This is the first time, however, that we rented a house. It made our vacation so much better! We appreciated the extra touches, like the telescope, you barely could see a ship in the distance, and then looking through the telescope, it brought it so close! Also, the map placemats on the kitchen table, books, magazines re: the area, are so enjoyable. Yes, we must also mention, as others have. Wow, the bed was so comfortable (thats a thought for a change at home). Thank you so much for this lovely visit to your home. I rented 6508 Aspenwood with friends this past weekend and really appreciate the great service from your office. The property was absolutely beautiful, both inside and out. This is one of the nicest vacation properties I've rented. The decorating was impeccable and there was not one thing out of place. A special thanks to Tala for the wonderful service she provided over the weekend. Thanks again! Thank you so much for a wonderful time in Lutsen. Castle Rock is a fantastic property - and it HAS EVERYTHING! With skiers on the mountain, we needed meals "to take" and good breakfasts and dinners in a timely fashion. Castle Rock provided the equipment for both and the space to spread out in the evening or to come together for a project or event. We will be back! We had a wonderful time. The condo was great. Thank you so much. We really loved having our own private cove for 5 days. We've been renting properties from you since 1995 and have never been disappointed. We sometimes like to try different places each time, but I think we will be coming back to Cathy's Cove again. We like how close it is to the bike trail and Tofte park, and Temperance River Sate park. A Superior Retreat is a most beautiful and comfortable home near Grand Marais that was perfect for our family. I would recommend it highly. Only negative is the driveway which is steep and our friends hit a big rock when backing out! But it was an lovely home and we plan to rent it again. We loved the Finn House! Ideal Spot!!! This place has it all. 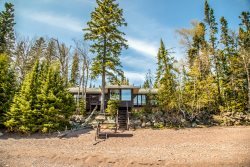 Excellent location, just minutes from Two Harbors and a close drive to Duluth. From this location, its easy to get lost in the beauty of the North Shore. Being right on the lake, the view from the house, the deck, or from the rocks is spectacular. The sound of the waves crashing on the rocks is like a lullaby as you turn in at night. The property has everything you need to make the comforts of home, not too far away, yet still speaks to the beauty of the area. Area trails are plentiful and weve enjoyed hiking to the top of Cascade Park trails on numerous occasions, and four wheeling in a number of area trails. Awesome views no matter where you go. The fishing on the lake is spectacular. We were lucky enough to catch nice sized lake trout, as well as some nice salmon. With the marina less than a mile away, fishing was easily assessable and has everything you need to make your day on the lake, superior. On other trips, weve also fished inland lakes and have had a great time pan fishing. Winter has proven to be a great time to visit the North Shore area. This cabin is a great location to reach both Spirit Mountain and Lutsen Mountain ski hills. We were surprised to see this cabin setup for skiers, complete with a boot and glove dryer. You dont see that in many rental places. Anyone who visits this location is sure to fall in love, as we did. Wed definitely go back for another visit! The north shore and Cascade Property rentals played a huge role in one of the most important days of my life my wedding! Originally from Minnesota, I always wanted an outdoor wedding ceremony somewhere along the north shore, but planning a wedding from Colorado (and depending on the weather) was a challenge. On a wedding planning trip home the fall before the big day, my friend Kris suggested checking out Beach Cliff House a vacation get-away just north of Two Harbors. The second I saw it I knew it was the place for me! The home is beautiful couldn't have asked for a nicer place and better view. The gazebo on the rocks is wonderful also. We will definitely be back next year. The location was wonderful. We loved waking up to the lake every morning, and we were just enough off the highway that we could hear it, but not see it. It is almost in the middle of north shore which made it wonderful for tourists like us. We enjoyed the journal that is left on the table that have entries from the different people that have stayed there. That was fun to read. It was all around a fabulous place to stay. The home made it feel like home. We are planning on coming back next year and we hope to get the same property. The location was perfect the view was breathtaking....you needed to read the notebook to be sure to turn to turn the water heater on....otherwise it was a wonderful set up.... we loved it! The home was clean, the kitchen well equipped. The location was good - closer to Duluth.